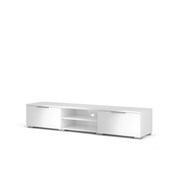 The Match TV Stand offers everything you need for your media storage and entertainment needs. The clean-cut and functional design features a framed panel door providing hidden storage for all your media components, DVDs, game controllers and remotes. Two cable holes in the back panels allow for easy grouping of media component cables so they remain organized and hidden from view. The foil surface is fade resistant and easy to clean.